Mr. Crocker from The Fairly Odd Parents, June 14, 2016. (http://cdn.smosh.com/). The tragic shame of fifty dead and fifty-three wounded because of one Omar Mateen’s anti-Black, anti-Puerto Rican, anti-gay, and anti-Islam hatred. The attack on an LGBT sanctuary in Orlando, Florida will continue to make news as the world learns more about the deceased attacker, his family and friends, as well as about the dozens of living and dead victims of Mateen’s venom. While there is much to learn about all of this, there is one thing Americans and the world already know. That we as Americans — politicians, media, and ordinary citizens — are incredibly quick at jumping to conclusions before we have any facts at all. Declaring Omar Mateen an example of “radical Islamism” when he barely brushed an arm of anyone even remotely connected to terrorism in the name of Islam? Thanks a lot, Hillary (you’re supposed to be the sensible choice of the two presidential candidates, right?)! Really, our reaction as a nation is no different from Mr. Crocker’s to unexplainable phenomenon on NickToon’s The Fairly Odd Parents – a play on the words “fairy godparents.” Until my son hit his preteens, I’d been subjected to six years of this ridiculous show about a permanent ten-year-old with fairies granting his every wish, all to his and the world’s detriment. 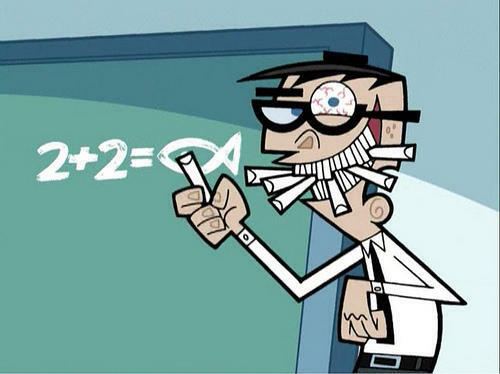 Mr. Crocker, his permanent elementary school teacher, once had fairies when he himself was a kid. Upon suspecting that his charge has fairies of his own, Mr. Crocker became obsessed, building gadgets and devising plans to prove to himself and the world that fairies exist. Or, even more extreme, to steal the ten-year-old’s fairies and use their power to dominate the world. But instead of yelling “FAIRIES!!! FAIRIES!!! FAIRIES!! !” every time a mass killing occurs in the US, we scream “TERRORISTS!!! TERRORISTS!!! TERRORISTS!! !” To be sure, what Mateen did was an act of terror. In our use of the term, though, Americans always mean terrorists who are of Arab descent, terrorists who claim Islam as their religion. We don’t do this for White “Christians” like Dylann Roof or, going back two decades, Timothy McVeigh. Why is that? Because we Americans are so obsessed with IS (Islamic State), that we never deal with our own -isms. Which ultimately may be why Mateen could take his internalized homophobia, racism, and misogyny and explode it into taking and harming the lives of so many innocents.